Liturgy and Laity offers a series of reflections on the doctrines underlying the Liturgy as outlined in the Constitution on the Liturgy. This volume also presents a series of prayer exercises known as Bible Vigils, which are meant to increase our knowledge and love of the Word of God. 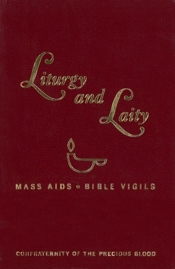 Liturgy and Laity is a prayer book designed to help average Catholics share deeply in the Church’s rich, liturgical life. Ideal for personal and liturgical use, it offers a series of reflections on the doctrines of the Liturgy as outlined in the Constitution on the Liturgy. The second part is a series of prayer exercises known as Bible Vigils, which are meant to increase our knowledge and love of the Word of God. They were selected and designed to prepare us for the Mass and to foster a continual renewal of the action of the Holy Spirit in our lives and in the Church. This book is perfect for use in group prayer among the family, study groups, and parish life. A portion of the proceeds from every purchase of this Confraternity of the Precious Blood title go directly to The Sisters Adorers of the Precious Blood in Brooklyn, NY to support them in their vocation.